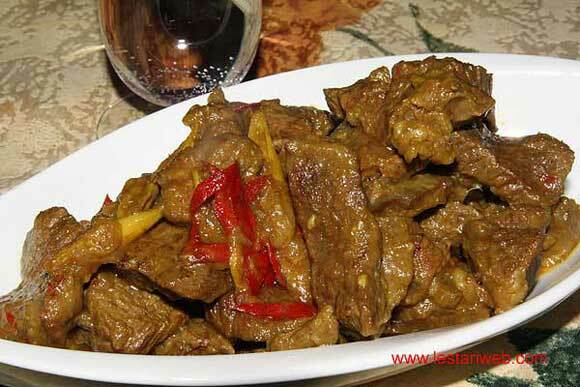 Here it is the typical cuisine of West Kalimantan Province: Pindang Daging Masrani. It was said, this recipe is brought by the Portuguese, who are Christians or in Indonesia called "Nasrani". A word Masrani & Nasrani, they both do have similarity, don't they??! Perhaps our colleagues from West Kalimantan Province can explain more detail about the origin of this name. Tipp: If possible use minutesteak. This sort of meat is tender and able to absorb the spices very well. If preferred you can also use fish as mainly ingredient. This dish called : Pindang Ikan Masrani. Slice the beef into about 1 cm thick, the shape depends on your taste. Slice the shallots, garlic, chillies thinly. If roasted ground turmeric is used : Put in a mortar/grinding stone and grind until smooth. Heat 2 tbsp oil in a frying pan or a wok and stir fry all the spices. Stirring all the time until fragrant. Add the sliced beef. Stir fry until the beef becomes harder / half cooked. Add the hot water ***. Adjust the seasoning. Add the salt & sugar to taste. 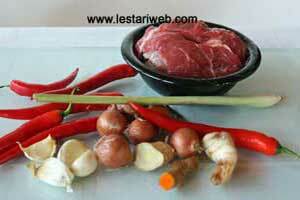 *** Add the hot water into the meat then cook on the medium heat to preserve it's best taste. Adjust the heat into medium and simmer until the beef well cooked.